Nailite’s Dotting Tool Set provides excellent tools for making dots and dot flowers, and the set comes in 10 different ball diameters sized from 1/32” to 5/16”. The Dotting Tools can also be used to make swirls or zigzag patterns in unique designs by blending colors together in a water solution or on the nail plate in a radical design. 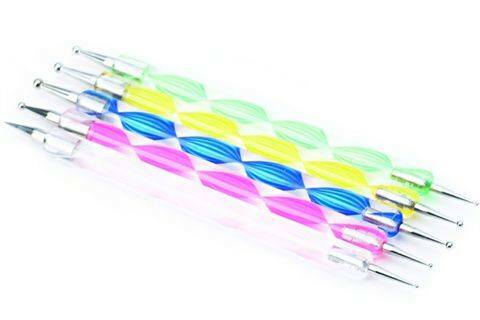 The tools feature attractive clear acrylic handles with a swirl ribbon inside and stainless steel ends for durability.